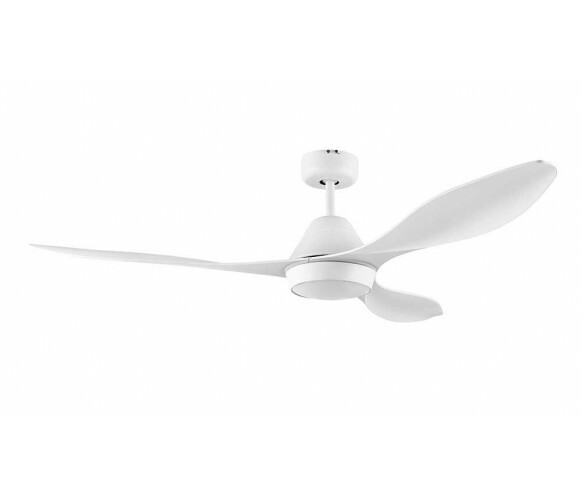 The Eglo Nevis DC with LED Light ceiling fan is a beautifully designed ceiling fan that is both functional and energy efficient. The Nevis is available in a Matte White or Matte Black finished colour featuring 3 durable ABS 52" (1300mm) blade diameter moulded plastic blades which provide a higher airflow than wooden blades and also features an energy efficient DC motor using up to 70% less energy than standard A/C ceiling fans. Perfect for illuminating the room, the Nevis features a bright 1500 lumen 18W LED in a 4000K neutral white colour temperature. Included with the Nevis ceiling fan is a 5-Speed remote control which features a timer function and summer / winter reverse switch.